This tutorial covers how to create a stateful elastigroup using the Stateful Creation Wizard, that is able to persist Volumes, Elastic IPs, Private IPs and more, across spot interruptions. Using Stateful Elastigrops, allows you to run a variety of stateful workloads using managed and SLA driven Spot Instances. First, we’ll start by creating a new Elastigroup, selecting ‘Stateful’ under the Use Cases tab. Set the initial capacity for your group. Select your desired VPC to run your Elastigroup in, as well as the Product type and the Image you wish all instances to be instantiated from. Select the security groups to be attached to the instances and the key-pairs associated with them. Lastly, you can optionally choose to add tags to your stateful group’s instances. 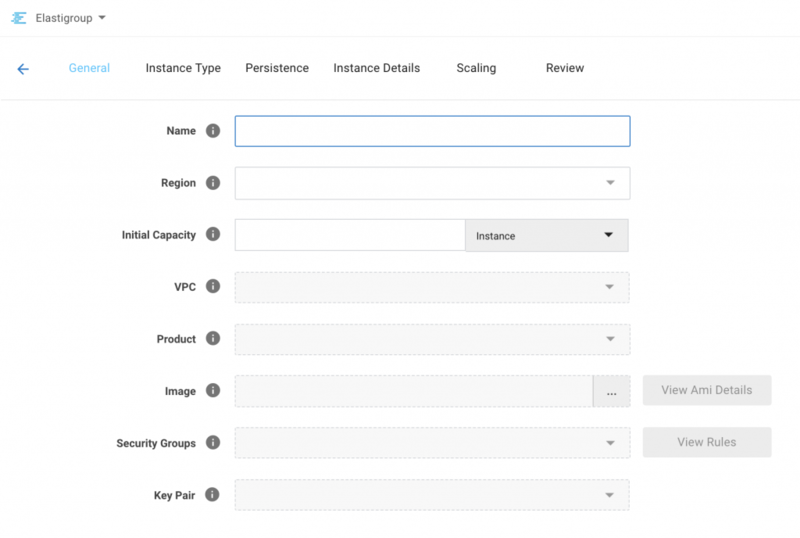 Select the On-Demand instance type you would like to be used in case there aren’t any spot instances found for your instance type. Select the instance types you would like Elastigroup to consider when launching your spot instances. We recommend selecting multiple instance types to provide Elastigroup with as many Spot instance market options as possible. In this step, you are required to choose which type of persistence you would like your elastigroup to maintain. Choose whether you would like elastigroup to persist your instance root volume or data volumes, upon interruption. You can also pick the type of method in which data volumes are maintained, connected, and backed up. Choose whether you would like elastigroup to persist network settings, such as Instance private IPs. Note: At least one persistence feature has to be selected in this step. 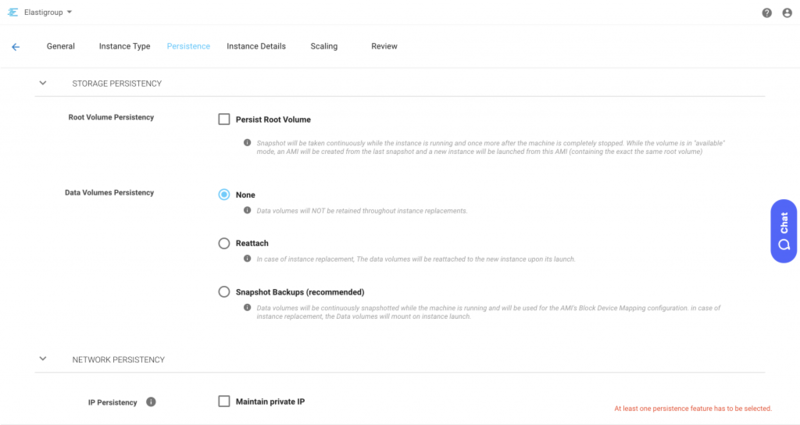 Select launched instance details, like IAM role, tenancy, whether to apply detailed monitoring EBS optimization or EC2 Autohealing. Fill in any userdata or shutdown scripts you would like to run upon instance starting or terminating. You can now review your Elastigroup configuration, and finish the creation process.